Wendy- Unicorns, Mermaids, and Faeries, Oh MY! I cannot find my favorite pink blouse. It is not simply a blouse, however; it is a lifeline. Let me take you back some several hundred years to its beginnings with us. Romeo and I never, across these four centuries or more, learned from whence the pink silk received its magic. Draped as it was outside the tomb, my Romeo and I questioned not its existence; rather, we simply assumed advantage from it. You see, on our escape from the tomb that late-July night, we possessed no dressing gowns or proper clothing to cover our frames. The embalming fabrics had proved worthless in both form and function; impractical in every possible sense. Romeo had graciously helped unwind the dressings from my slight frame just as readily as I offered assistance to him. As sunrise approached and the time for our great escape drew necessary, we pushed aside the stones that covered the opening to the tomb and happened upon a lovely surprise: Drawn up in a massive heart-shaped bunting outside the tomb were more than a dozen yards of rose-colored silk. Romeo, ever the gentlemen, wrapped me carefully in nearly all of the silk, tying the bodice tightly but leaving the skirt loose enough for me to run and climb. He spared only enough of the pink silk to fashion a modest codpiece for himself. And away we ran. Through the catacombs, up to the surface of the burial grounds, and past the grave markers of simpler folks, we sought our freedom. Over the rolling hills and through olive groves we made our way to the remote village outside Verona that would be our eternal home. There, with little more than the silk that covered us and the love that sustained us, Romeo and I began our lives. But I digress. The Bard of Avon created a tragedy filled with romance, rebellion, drama and a few healthy sprinklings of comic relief. Romeo and I, with the aid of the magic silk, created eternity. That eternity was unplanned. In the early decades of our forever-on-Earth we suspected the silk’s power, noticing that only when wearing the silk did our health and stamina thrive. Without the silk, we developed weaknesses and ailments only cured by replacing the silk. Therefore, when our baby girl was born the April after our escape, I developed my talent as seamstress. 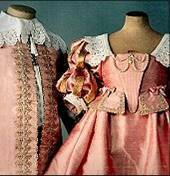 Over these many years I have crafted, assembled, disassembled and remade the silk into hundreds of patterns to adorn not only myself and Romeo, but our beautiful daughter, Romiet. As she grew, I kept her safe with a piece of silk close to her body, only removing it to allow her to grow in body and mind from time to time. After all these centuries, however, we now find ourselves at a stopping point. Romiet is 14, as, oddly, am I still. We are a family made up of three teenagers, two of whom are parents wielding no influence over the third. Can one imagine any dynamic more destructive – even in the presence of the magic silk? Nevertheless, this is where we find ourselves on this late-July night in 2013. Romiet has stolen the blouse. As family dramas go, and as dramatic tragedies are written, daughters rebel against their mothers. Romeit has stolen the blouse. She has stolen it to protect her own eternity. My loving Romeo and I must now rest, at last. We have bathed in our 420-year romance and now it is time to succumb to Shakespeare, who wins the tragic ending to his tale. 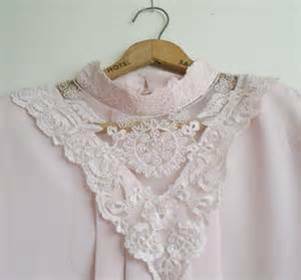 If there is justice to be found in this tragedy, it lies in this truth: The beautiful young Romiet – who never bothered to learn my seamstress trade – must now live out her remaining centuries in a vintage pink blouse with poufy sleeves and a hideous, ornate collar – circa-1593 meets circa-1984. This post was written by Cameron, who has not been writing enough fiction this past year for her own liking, but is grateful still to be counted among the BBB Gals and who, oddly, has referenced Shakespeare in two of her three bbbgals posts.